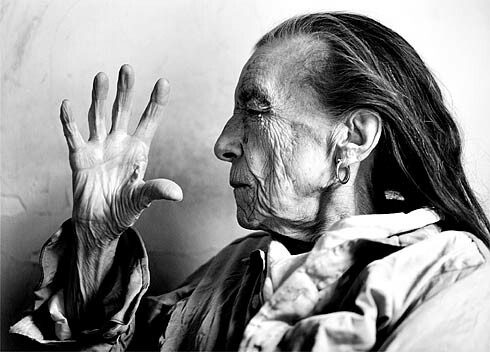 Aside from founding an art movement, creating countless masterpieces in pretty much every medium available, and providing academics of all sorts with a near endless array of things to talk about, Louise Bourgeois also did some writing. As with everything else she did, Bourgeois’ writing is pretty good—but Bourgeois recognized that not everyone is multitalented. In 1954, she wrote a short artist’s statement that not only did what most artist statements do—describe the work in question—but also briefly critiqued artist’s statements in general. In the artist’s statement, Bourgeois notes that “the artist who discusses the so-called meaning of his work is usually describing a literary side-issue.” But the purpose of the statement is not a simple ‘images-over-words’ argument (in fact, Bourgeois arguably considered the writer superior to the artist). Instead, Bourgeois also acknowledges that the results of an artist’s “battle” to create a statement may “be surprisingly dull.” In other words, not all artists are good writers. Bourgeois’ point is particularly interesting in light of her meta-statement’s conclusion: “just the same, the artist must say what he feels.” The work of the artist, for Bourgeois, is not enough. The artist must write what she feels in order to effectively communicate. The statement applies to more than just artists, though. The need to express feeling, and communicate effectively is universal—it is human. Bourgeois was a professional, and her profession was art. She was also talented as a writer, but she recognized the paradox that many artists (and we can extrapolate, many professionals of all kinds) face: the professional must express her or himself with words, yet words are not her or his profession. Enter the ghostwriter. While Bourgeois’ genius extended to her writing abilities, the problem she hints at is real and needs a solution. The rise of ghostwriting is a response to this problem. Writing is a profession, a skill, and an art, just like Bourgeois’ paintings and sculptures. Any profession aside from writing—whether it is art or business—inevitably finds itself needing expression. While Bourgeois highlighted the artist’s professional requirement to describe her work, the businessman may need to do the same.